January 8, 2017 by Susan B.
I just came across a December article from New York Magazine called, “Should I Go on a Money Diet This January?” by Charlotte Cowles. It painted a clear portrait of the difference between a budget-minded philosophy and a recovery-centered vision without ever mentioning a 12 Step program. If you’re like me, once you are in that binge-mode, nothing but running out of credit or hitting some other really severe bottom will make you stop for more than a brief period. Creating a cycle of extremes is really what a compulsive spending addiction is about. You work yourself up with desire to buy, indulge in the desire, feel remorse and shame, vow to stay sober with your spending … until you start to feel better or the disease desire overcomes the remorse and shame. That’s not what worked for me or for anyone I know in recovery. It’s stopping the cycle of extremes that worked for us in the long term. Just reading that makes me have trouble breathing. 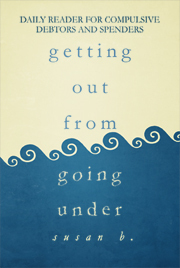 Recently, someone I know in recovery decided to go on a three-month spending moratorium. She has been sober with money for well over a year. She has an established program, which, in her case, includes speaking to her sponsor five days a week, committing her spending daily, doing writing and a daily inventory, attending meetings, no debting of any kind, and having a network of support. Having been abstinent with money for a period of time helped her to see that she still suffered with more compulsion around her discretionary spending than she’d like. It was the mental and emotional part of spending. She’s no longer out of control with money. But she continues to want to increase her peace around her relationship with spending. So, she made a measured decision, over a few weeks, and in concert with her sponsor and pressure relief group, to go on a three-month moratorium around her discretionary spending – specifically entertainment and restaurants. Now, how is this any different than the spending diet that those other women proposed? It’s vastly different. For one thing, it’s not a knee-jerk response to a spending binge. The reason for the moratorium is to enhance her recovery thinking, not as “penance” or punishment for out of control spending. So for instance, she didn’t stop her automatic withdrawal for Netflix. In her case, she focused on active pain points, such as buying art supplies, books, clothing, classes, going out to eat or out to the movies. In addition, there is a plan in place for how she’ll do this, support all around it, and most importantly, when the three months is over, she will continue to live soberly with money according to her existing spending plan. In other words, she’ll be able to spend what she allocates in those categories, but hopefully, with less heat and urgency around her discretionary spending, more insight into why and what she chooses to purchase, and an increased ability to pause by choice before making the purchase. Plus, her reason for the moratorium is not to make her creditors her master, but for her to experience mastery over her disease. In recovery from compulsive spending, repaying our debt is important, but it is not more important than living a balanced life. Yes, we learn to be responsible around our spending, but making our creditors our Higher Power is absolutely putting our eggs in the wrong basket. As I’ve shared before, I paid off my $34,000 debt in seven years with a balanced spending plan and despite becoming disabled a year into my debt repayment. I addressed this at length in episode 34 of my podcast, which was called, “Pay it Fast or Pay it Slow,” where I talked about a guy on the Dave Ramsey show who paid off $40,000 in a year and a half by living in abject deprivation. I guarantee you that if I had tried to do that, I would not still be sober with money. As far as I’m concerned, recovery from compulsive spending is about healing, not punishment. Back to my friend, rather than finding this moratorium a teeth-gritting experience, she has felt a sense of relief and a surprising amount of peace by surrendering to this process. Even so, over these first few weeks, there have been struggles within her as the disease of compulsive spending tried to overcome her with desire and delusion. She became vague about clear-cut spending that would violate her commitment. And it was only with her own honest admission and her sponsor’s help that she could see the truth and let go to continue on to complete her commitment. So the biggest difference between a spending fast and a spending moratorium is that my friend is not deluding herself that she will no longer be a compulsive spender when this challenging process is complete. 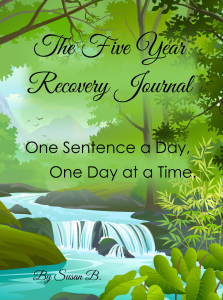 Though recovery is just one day at a time, it’s most likely that because she has a strong program already in place, she isn’t going to revert to her old ways or succumb to her addiction. She engaged in this process already committed to living a new way of life with her spending one day at a time. I, too, did a three-month moratorium after five years of recovery. I did it because I would spend my entire discretionary allocation pretty much within the first day or two of each month, and I felt imprisoned by that constant nagging desire for stuff that would build up throughout the month. Yeah, the pressure would get released as soon as the new month began, but new desire would arise within a few days, and sometimes a few hours. It was really painful. And so, I, too, made the commitment not to spend on discretionary items for three months, hoping to find the relief others I knew had found by going through that process. My experience was less peaceful than my friend’s, but highly rewarding, nonetheless. The biggest gift I received was learning to embrace delayed gratification instead of railing against it. This is now just about my favorite tool in an arsenal of weapons I have against compulsive spending. And once I completed the moratorium, I didn’t plunge into the darkness of out of control spending. But I can tell you with certainty that it is only because I didn’t go into this process just after a binge. In addition, recovery and the moratorium taught me that all my spending is about choices. When we set about the task of creating a spending plan, we must first decide on the categories within it. But when we actually allocate our money to these categories, that is the moment we are choosing what is most important to us around our spending. Of course, we can’t have everything we want the moment we want it. But with any discretionary money, you choose how you will spend it or save it. So you can give yourself one movie a month and put more into saving for a vacation. Or maybe you want an expensive pair of winter boots. You can choose to save up using part or all of your clothing allocation. You can view that as deprivation or as a sober choice you are making to get something you want while living within your means. A moratorium can help you become more willing to set long-term goals instead of feeling deprived of something that may take you months to save up for because you feel the urgency to spend the money as soon as it’s available. Meanwhile, both DeGraff and Klontz advocate for creating “spending plans” rather than punitive measures of slashing large swaths of expenses. “‘Money diet’ and ‘budget’ sound like confining tools, but a spending plan creates a growth-oriented mind-set,” said DeGraff. Instead of deciding what you can’t have, figure out what you want to have. As Klontz describes it, “With a spending plan, you ask, ‘What’s most important to me, in terms of spending money? Let’s create a vision for that. Do I want to retire early? What will that look like? Where am I living?’ Whatever it is, get really excited about it, and come up with a plan to fund those things that mean the most to you, and then, in that spirit of fullness and abundance, reduce your spending on the stuff that doesn’t matter. This entry was posted in Awareness, Compulsive Shopping, Delayed Gratification. Bookmark the permalink.